The brain and heartbeat of Full Moon and High Tide Studios, the rack room contains state-of-the-art television equipment. 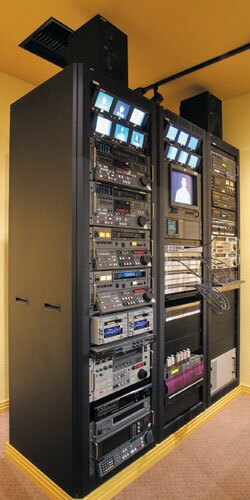 From Digital Betacam and Betacam SP to DVCAM, D-2, ¾” and VHS, the rack room makes recording your programs easy and quick. A multi-standard VHS can standards convert to/from PAL or SECAM to the NTSC American standard. Audio recording uses Tascam DA-98HR eight track digital recorder, Tascam 112R audio cassette recorded and Tascam DA-20 DAT digital recorder. A Tascam CD-150 CD player is used to transfer audio CDs. Extensive patching lets you interface any machine to any suite. It’s that kind of flexibility that makes your sessions flow smoothly at Full Moon & High Tide. ©2003-2009 Full Moon & High Tide. All rights reserved.